An inter-ministerial committee has been established to oversee the accelerated land reform process, with a presidential advisory panel on hand to assist the committee in its work. Despite the numerous problems, the land claims process has made a difference to the lives of hundreds of thousands of South Africans denied their birthright, but land reform needs to be accelerated to correct this historical injustice, President Cyril Ramaphosa said on Saturday. Speaking at the Ebenhaeser land claim settlement ceremony in the Matzikama local municipality on the West Coast near Vredendal, he said the handing over of these title deeds was a historic occasion because it included the first ever settled land claim in the Western Cape to descendants of the Griqua people. “Although human rights are by their nature universal, it is the rights of society’s most vulnerable that we must take particular care to enforce and protect. Farmworkers and labour tenants on farms are the lifeblood of our country. It is your hands and your labour that puts food on our tables. Without your daily efforts all the farms around the country would not be able to produce, sell, and export the many agricultural goods for which our country is famous around the world,” Ramaphosa said. More than half a century ago, the people of South Africa declared in the Freedom Charter that the land shall be shared among those who work it. With the passing of the Restitution of Land Rights Act of 1994 government set about giving effect to that declaration. “Over the past 25 years ago, we have been able to harness the provisions of this law to begin to change the skewed patterns of land ownership in our country. Across the length and breadth of South Africa, land has been restored to its original owners, be they individuals or community. 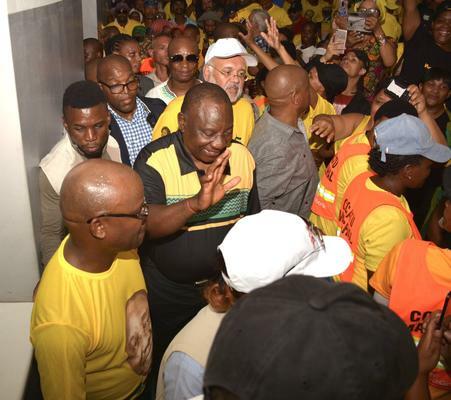 In other cases, where it was not feasible to return land, individuals or communities were financially compensated,” Ramaphosa said. “Despite the numerous challenges we have faced, the land claims process has made a difference to the lives of hundreds of thousands of South Africans denied their birthright. But land reform needs to be accelerated if we are to correct this historical injustice. The slow pace of reform has caused impatience among our people, and justifiably so,” he said. An inter-ministerial committee had been established to oversee the accelerated land reform process, with a presidential advisory panel on hand to assist the committee in its work. “Ours is a Constitution founded on the principle of social justice. With democracy, all our people were afforded equal rights as we laid out our vision for a non-racial, non-sexist, free, egalitarian society. Having land returned to its rightful owners is just the first step towards sustainable and enduring land reform. “It is a priority of this government to ensure that we provide the necessary support to communities who have had their land returned to them in order for it to be utilised productively and effectively, and to support our broader goals of agricultural growth and economic transformation. I am therefore particularly pleased that the Ebenhaeser community wants to use the land for productive purposes,” Ramaphosa said. There were already various agricultural activities, including livestock farming, taking place on some of the farms, and three harvests had been completed so far. “I am pleased to note that the emerging farmers in the community are being supported through the Ebenhaeser Farmer Production Support Unit and have established a co-operative model to build capacity in livestock, vineyards, lucerne, and hay production as well as fresh produce. The farms had combined water rights for 132 ha from the Olifantsrivier Irrigation Scheme, which would greatly help the community in its future agricultural activities. Land reform was not just an imperative for social justice. It was also part of the greater drive to grow the economy and create jobs. In the economic recovery and stimulus package announced last year, government prioritised support to the agricultural sector. “We have a vibrant and diverse agricultural sector and it is ripe for investment. As more land is made available for agriculture and its associated activities, and more historically disadvantaged communities are bought into the mainstream, we will be better able to ensure our nation’s food security. We are determined that our accelerated land reform programme should expand economic opportunities in areas where our people live. “Whether it is through agriculture or, in places like Paternoster, through tourism, there is huge potential for job creation. Our accelerated land reform programme is an imperative if we are to correct the wrongs of the past. But it is also in the interests of social cohesion and harmony between the different race groups in our country. “Given the excesses of our past, we cannot and must not return to a place where one race turns on another, and where instead of societal harmony, there is only bitterness, discontent, and anger. We have come too far, and we have too much to look forward to. This is why what we celebrate here today represents so much more than the return of land to the descendants of its original owners,” Ramaphosa said.